Clemson Girl: Visit the Game Day Divas this weekend in Clemson and get 20% off any one item!! 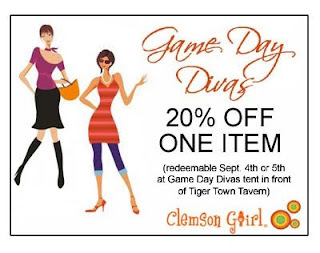 Visit the Game Day Divas this weekend in Clemson and get 20% off any one item!! If you’re going to be in Clemson this weekend for the first home game (hooray, football season is here! ), then you have to visit downtown and see the Game Day Divas. The Game Day Divas will be setting up shop for the third year in a row in front of Tiger Town Tavern on College Avenue every Clemson home football weekend. Owners, Tommi and Lynn, have found this spot to be ideal for reaching all of the Clemson Girls on home game weekends. You will find them there Friday for the First Friday parade from 3 p.m. to 7 p.m. EST. Then they’ll be back again, bright and early Saturday morning at 9 a.m. EST. Kickoff isn’t until 6 p.m., so that leaves you plenty of time to get some shopping in downtown. Game Day Divas has grown over the past three years and are constantly expanding their product line. Tommi and Lynn strive to find fun and hip clothing and accessories for women to wear to any Tiger event. They also only purchase a limited quantity of each item, so you won't see it everywhere you look! That is what makes their stuff unique!! SPECIAL OFFER FOR CLEMSON GIRL READERS!! This is a great week for Clemson Girl readers – I am so excited. Visit the Game Day Divas this weekend and use this coupon to get 20% off any one item! There are even more new products to shop from this weekend that you won’t find on their Web site yet. Since Game Day Divas replenishes jewelry for each home game, you will not see their fashion jewelry online. And, they are super excited to have just picked up a new product line that was made exclusively for Game Day Divas – gorgeous, handmade Swarovski crystal tiger paw buckles! They will have them this weekend for the Diva and the little Diva! Use your 20% off coupon and be the first Clemson Girl to wear this new buckle! And just when you thought 20% off was pretty sweet, Game Day Divas would also like to give away some of their favorite products FOR FREE! Here are the details – if you are the FIRST Clemson Girl to go to the Game Day Divas tent this Friday, Sept. 4th and mention that you read this post on ClemsonGirl.com, you’ll get a free set of their Tailgate Party Cups! So you can use them on Saturday at your tailgate! It gets even better…If you are the 25th Clemson Girl to go to the Game Day Divas tent this Saturday, Sept. 5th and mention you read this post on ClemsonGirl.com, you’ll get your choice of one of these three stylish orange and white, circled handbags! Check them out below – I love these! Who would have thought the first home game weekend would be so rewarding! Discounts and giveaways galore! 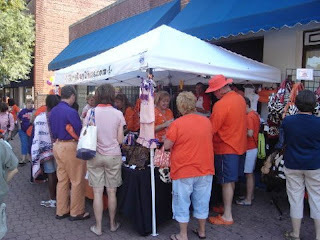 So be sure to get downtown this weekend and visit Tommi and Lynn at the Game Day Divas tailgate tent in front of Tiger Town Tavern – check out all of their new Clemson products and possibly win one! It’s like Christmas in September. Thanks Game Day Divas! Go Tigers!